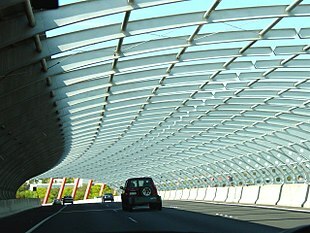 The sound tube in Melbourne, Australia, designed to reduce roadway noise without detracting from the area's aesthetics. A noise barrier (also called a soundwall, noise wall, sound berm, sound barrier, or acoustical barrier) is an exterior structure designed to protect inhabitants of sensitive land use areas from noise pollution. Noise barriers are the most effective method of mitigating roadway, railway, and industrial noise sources – other than cessation of the source activity or use of source controls. Noise barriers have been built in the United States since the mid-twentieth century, when vehicular traffic burgeoned. I-680 in Milpitas, California was the first noise barrier. In the late 1960s, analytic acoustical technology emerged to mathematically evaluate the efficacy of a noise barrier design adjacent to a specific roadway. By the 1990s, noise barriers that included use of transparent materials were being designed in Denmark and other western European countries. Below, a researcher collects data to calibrate a roadway noise model for Foothill Expressway. Acoustical scientist measures sound in noise barrier design study, Santa Clara County, California. The best of these early computer models considered the effects of roadway geometry, topography, vehicle volumes, vehicle speeds, truck mix, road surface type, and micro-meteorology. Several U.S. research groups developed variations of the computer modeling techniques: Caltrans Headquarters in Sacramento, California; the ESL Inc. group in Sunnyvale, California; the Bolt, Beranek and Newman group in Cambridge, Massachusetts, and a research team at the University of Florida. Possibly the earliest published work that scientifically designed a specific noise barrier was the study for the Foothill Expressway in Los Altos, California. Numerous case studies across the U.S. soon addressed dozens of different existing and planned highways. Most were commissioned by state highway departments and conducted by one of the four research groups mentioned above. The U.S. National Environmental Policy Act effectively mandated the quantitative analysis of noise pollution from every Federal-Aid Highway Act Project in the country, propelling noise barrier model development and application. With passage of the Noise Control Act of 1972, demand for noise barrier design soared from a host of noise regulation spinoff. By the late 1970s, more than a dozen research groups in the U.S. were applying similar computer modeling technology and addressing at least 200 different locations for noise barriers each year. As of 2006, this technology is considered a standard in the evaluation of noise pollution from highways. The nature and accuracy of the computer models used is nearly identical to the original 1970s versions of the technology. The acoustical science of noise barrier design is based upon treating an airway or railway as a line source. [dubious – discuss] The theory is based upon blockage of sound ray travel toward a particular receptor; however, diffraction of sound must be addressed. Sound waves bend (downward) when they pass an edge, such as the apex of a noise barrier. Barriers that block line of sight of a highway or other source will therefore block more sound. Further complicating matters is the phenomenon of refraction, the bending of sound rays in the presence of an inhomogeneous atmosphere. Wind shear and thermocline produce such inhomogeneities. The sound sources modeled must include engine noise, tire noise, and aerodynamic noise, all of which vary by vehicle type and speed. The noise barrier may be constructed on private land, on a public right-of-way, or on other public land. Because sound levels are measured using a logarithmic scale, a reduction of nine decibels is equivalent to elimination of approximately 86 percent of the unwanted sound power. A wall with porous surface material and sound-dampening content material can be absorptive where little or no noise is reflected back towards the source or elsewhere. Hard surfaces such as masonry or concrete are considered to be reflective where most of the noise is reflected back towards the noise source and beyond. Noise barriers can be effective tools for noise pollution abatement, but certain locations and topographies are not suitable for use of noise barriers. Cost and aesthetics also play a role in the choice of noise barriers. In some cases, a roadway is surrounded by a noise abatement structure or dug into a tunnel using the cut-and-cover method. This noise abatement wall in The Netherlands has a transparent section at the driver's eye-level to reduce the visual impact for road users. Normally, the benefits of noise reduction far outweigh aesthetic impacts for residents protected from unwanted sound. These benefits include lessened sleep disturbance, improved ability to enjoy outdoor life, reduced speech interference, stress reduction, reduced risk of hearing impairment, and a reduction in the elevated blood pressure created by noise (that improves cardiovascular health). Sound barrier walls vary in cost depending on the type and quality. Concrete is popular due to lower cost. Since they are reflective, they could potentially create noise for those across from the barrier. Absorptive barriers absorb, and thus abate the noise more effectively, but cost more as they are often custom built and are composed of a variety of materials that allow for absorption. With regard to berm construction costs, a major factor is the availability of excess soil in the immediate area which could be used for berm construction. If the soil is present, it is often cheaper to construct an earth berm noise barrier than to haul away the excess dirt, provided there is sufficient land area available for berm construction. Generally a four-to-one ratio of berm cross sectional width to height is required. Thus, for example, to build a 6-foot-high (1.8 m) berm, one needs an available width of 24 feet (7.3 m). Roadside noise barriers have been shown to reduce the near-road air pollution concentration levels. Within 15–50 m from the roadside, air pollution concentration levels at the lee side of the noise barriers may be reduced by up to 50% compared to open road values. Noise barriers force the pollution plumes coming from the road to move up and over the barrier creating the effect of an elevated source and enhancing vertical dispersion of the plume. The deceleration and the deflection of the initial flow by the noise barrier force the plume to disperse horizontally. A highly turbulent shear zone characterized by slow velocities and a re-circulation cavity is created in the lee of the barrier which further enhances the dispersion; this mixes ambient air with the pollutants downwind behind the barrier. Wikimedia Commons has media related to Noise barriers. ^ Wagner, Kate (8 December 2016). "Building the Wall: Highway Sound Barriers and the Evolution of Noise". 99 Percent Invisible. Retrieved 21 March 2017. ^ "4. Noise Barrier Types - Design - Design Construction - Noise Barriers - Noise - Environment". U.S. Federal Highway Administration. Retrieved 2017-01-16.